Since the beginning of the plastic era, starting circa 1950s, millions of tons of plastic debris has entered the world’s oceans. As society has continued to grow, so too has the production and consumption of plastic. Upon entering the ocean the polymers gradually breakdown and concentrate into five rotating currents, called gyres. In these gyres it has been discovered that plastic polymers out number the plastic six to one, and sometimes much more. Plastic is non-biodegradable, this means that it only breaks down into smaller and smaller bits until it is eventually ingested by birds and fish because it resembles their natural food source, zooplankton. If it reaches micron-sized particles then it is eventually ingested by filter feeders such as various types of invertebrates. Since plastics in the ocean environment remain there, we must not only develop ways to stop them from reaching the ocean in first place, but also how to remove the plastic debris that is already there. When it comes to global environmental challenges, it is easy to feel overwhelmed, however one person can make a huge difference in even this field. One such example is Boyan Slat, whom founded the Ocean Cleanup at 19 years old, and has proceeded to provide the world with the most realistic and implementable solutions for cleaning the plastic out of the gyre. The Ocean Cleanup has embarked upon its mega mission to clean the worlds oceans in 2015, and is set to fully begin its clean up in 2020. Boyan has proved to the world that one persons dedication, passion and commitment are all you need to change the world. One of the first requirements is to get in the habit of thinking positively, and looking for the good and positive aspects to life, even in regards to something as huge and discouraging as the polluted state of the ocean. Small activities and exercises can help students get in the habit of seeing the world in a positive light, learning to see all challenging situations as opportunities for growth, change and learning. 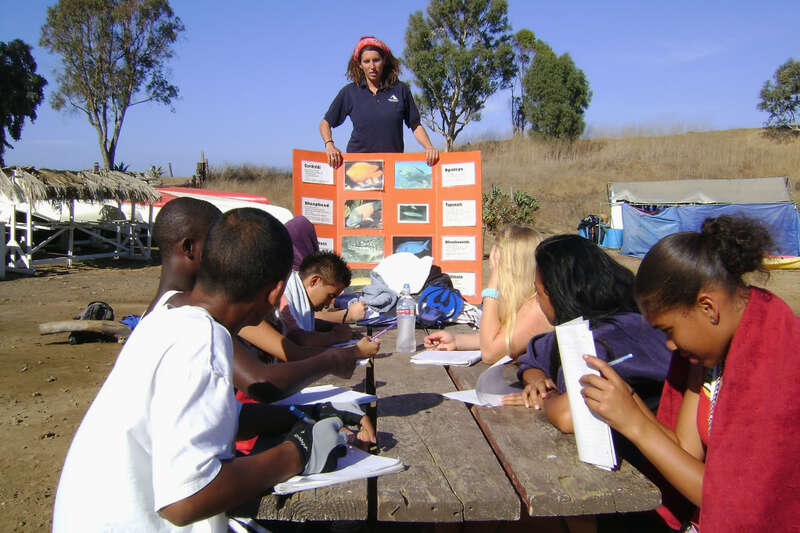 Mountain and Sea Adventures has been running outdoor education environmental science camps on Catalina Island for over 20 years, and providing hands-on learning opportunities, which develop a personal love and understanding for the marine environment. Every school that comes to our science camp at Emerald Bay has the opportunity to spend time learning about the current challenge to the ocean in the form of plastic pollution, and its impact on marine wildlife. After watching a very interesting and educational documentary about the topic, breakout groups are formed giving each and every student the opportunity to brainstorm solutions together. After developing ideas each breakout group is given the chance to present their ideas to the whole group. This gets the students not only thinking and talking about what they can do, but discussing it among each other as a group and as a class. This has led to the formation of countless green clubs and environmental school-wide efforts, as students are excited to take the momentum they built at camp back into their homes, towns and schools. Mountain and Sea Adventures hosts the most educational, fun and adventurous summer programs for kids in California. From our amazing shipboard summer camp exploring the various coves of Catalian Island, to our marine science day camps in San Pedro and the Newport Back Bay. MSA offers something for everyone and is bound to be the highlight of your child’s summer! 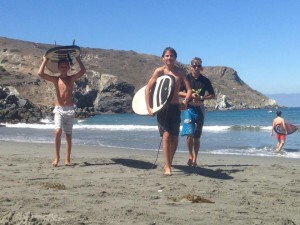 This program is unlike any other summer camp on Catalina Island. Your child lives aboard a marine research vessel for a full week of snorkeling, kayaking and exploring the beaches, coves and trails of Catalina Island. Summer camp for kids and teens is not only fun and exciting at every activity, but imparts high self-esteem, social skills, and other altruistic character traits. One day might include snorkeling at a premiere island location, then going to shore for games and recreational activities, fishing, kayaking, and exploring trails, sea caves and tide pools. Students get the opportunity to do hands-on field biology research, and learn how to keep a field journal and use the scientific method to think like an actual marine biologist. This makes doing certain activities such as snorkeling at the oldest marine preserve on the island, at the USC Wrigley Marine Institute’s cove nearby the isthmus, even more exciting. The week always seems to fly by so fast, like they say: Time flies when you’re having fun! A whole week of surfing, camping, meeting new friends and playing in the ocean together is just never enough! Perhaps this is why our campers always end up coming back year after year, to let the adventure continue! 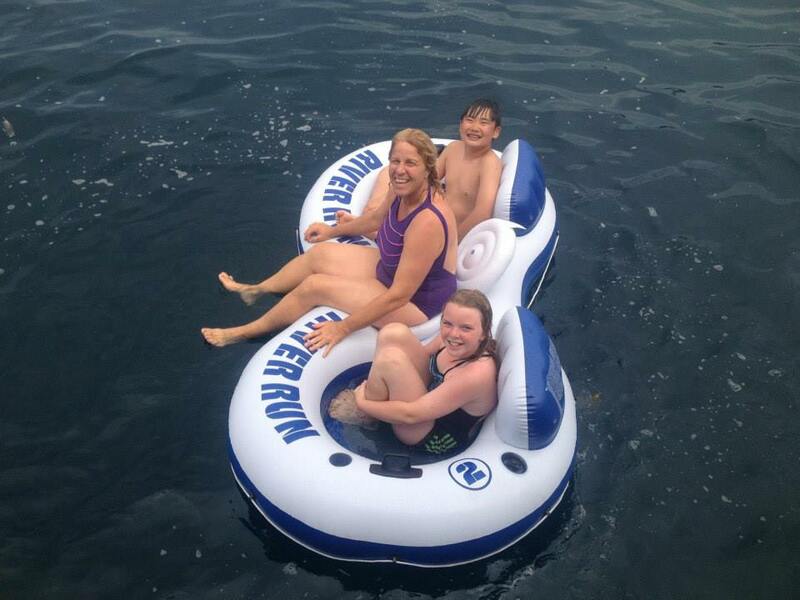 MSA has now made it possible for families to enjoy a few days spending valuable time together on Catalina Island. Families live aboard a fully stocked and equipped marine research vessel and have the chance to visit many various coves and beaches, including a fireworks show at either Avalon or Two Harbors for our fourth of July family camps. 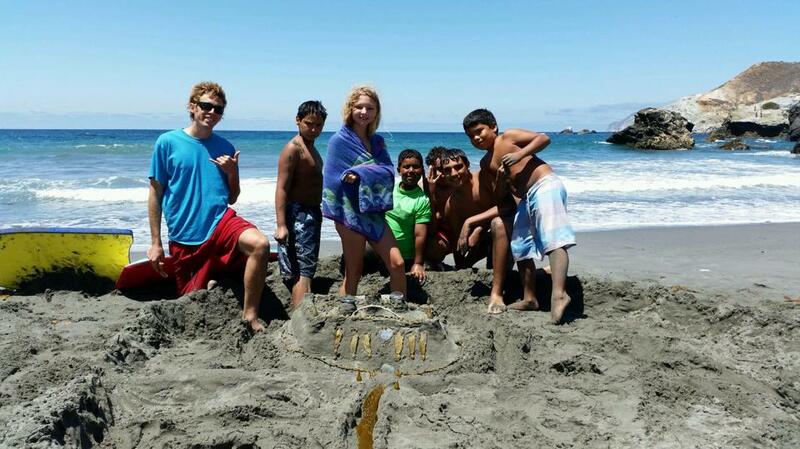 Located at Cabrillo Beach in San Pedro is our summer day camp program. 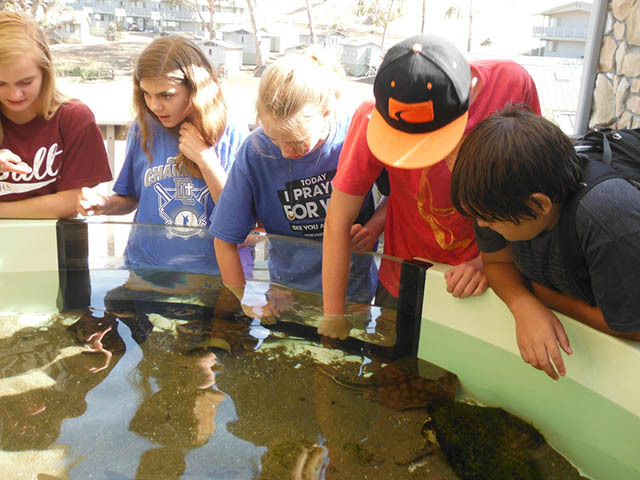 Campers enjoy educational and fun activities about marine biology and environmental science, as well as visiting the nearby beaches and tide pools, kayaking, beach and pool play time, arts and crafts and lots of fun group games and activities. This camp focuses on imparting environmental stewardship skills, leadership and team building skills and building character in youth. 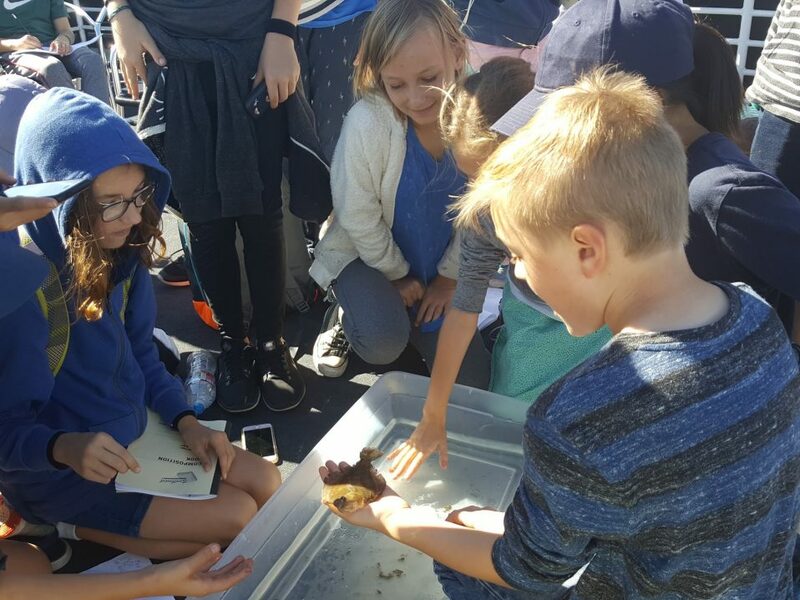 The Back Bay in Newport Beach is an incredible resource with an endless potential for education and imparting an appreciation for environmental science. MSA’s youth camp is set at the Back Bay Science Center, and has kayaks and canoes for exploring the back bay, as well as touch tanks, microscope labs and lots of fun and educational equipment and materials. Every day campers play fun games, learn about one of their marine animals, and express their creativity through arts and crafts, games and group activities. Mountain and Sea Adventures is dedicated to uplifting youth and teaching students to be aware of their environment and contribute productively to reduce negative impact, cleanup and help correct any damage, and take ownership in their surroundings. 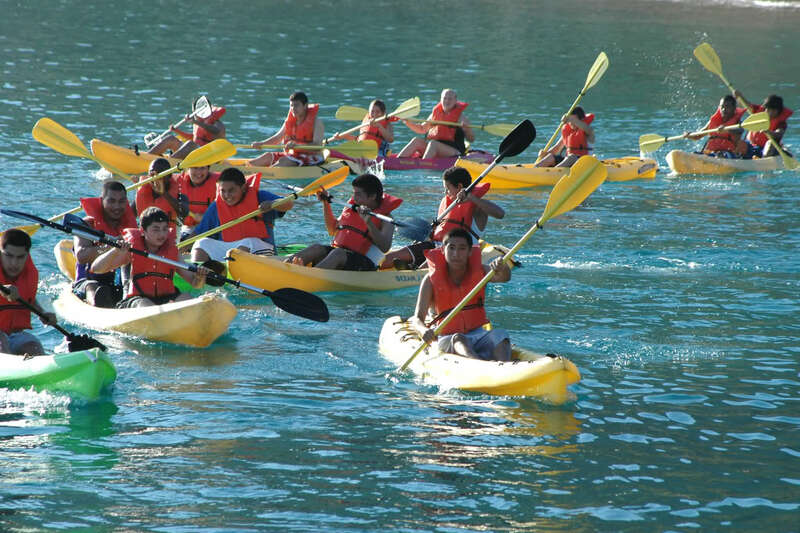 There is no better place than Emerald Bay for your outdoor education science camp on Catalina Island. Located on the far west end of the island, Emerald Bay may be the most remote camp on the island, but it’s facilities are among the most elite. With the most sophisticated salt water aquariums and touch tanks, on the island, the Pennington Marine Science Center is an amazing educational resource unto itself, not to mention the four marine ecosystems available to snorkelers in the cove itself. Emerald Bay is easily accessed by boat from Long Beach, the crossing gives students the opportunity to see dolphins, seals and sea lions, and quite frequently even grey and blue whales. There is no better choice for your school field trip. Catalina Island is a magical destination, one of the largest privately operated nature preserves in the world, affording your students the rare opportunity to see an abundance of wildlife such as Island Fox, bison, golden and bald eagles, deer, and other rare plants and animals. MAS’s science camp program each involves a short lecture, in-depth hands-on activities and then journaling time for developing a conclusion and gradually working on a hypothesis. 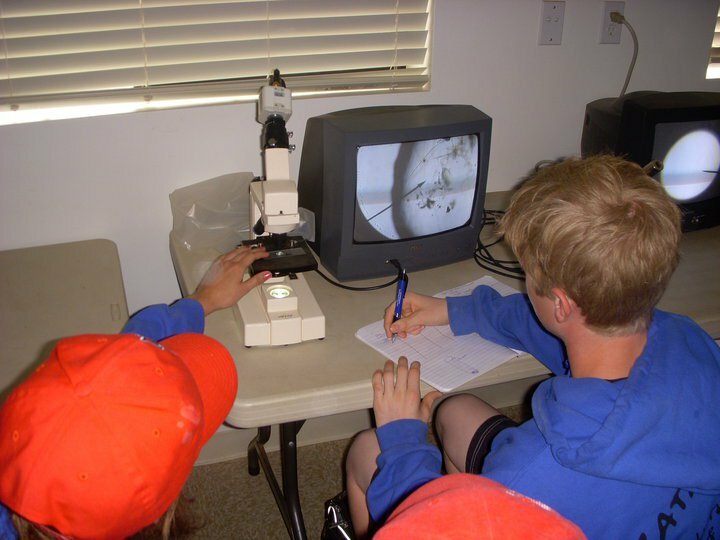 Campers are taught how to think like field biologist, how to use a field journal and how to understand the scientific process and use it in their own research projects. Catalina Island has an abundance or marine life, and has been an ecological conservation since 1972. Catalina Island has been preserved in its natural state with great success. In recent years a number of marine protected areas have been designated, limiting the fishing and gathering of sea life in those areas. Examples of Catalina Island marine life would include the California state marine fish, the Garibaldi, as well as Sheepshead, kelp bass, lobster and other invertabrates, sharks, rays and marine mammals such as seals, sea lions, dolphins and even the occasional California grey whale, which like to visit the island coastline during their migrations between Alaska and Baja. Just on the outskirts of Avalon (towards the east end) is Lovers Cover, a fun and very reliable snorkeling location. This is a perfect place for those who wish to come to Avalon to enjoy a vacation get away and looking for the best snorkeling spots to add to your trip. Lovers Cove is within walking distance of down town Avalon, but can also be reached by taxi if you are transporting gear or prefer not to walk. Alternatively, just pack a day pack and rent all your snorkel gear right beside the ferry terminal. As long as the visibility is good this is an excellent location to see some of the best of what Catalina has to offer. You have a well-protected cove (without a real beach) with kelp forest and your usual Garibaldi, opal eye, blacksmith, and even some recent sightings of sea turtles! If you are staying in Avalon and looking for local snorkeling and dive spots, your only other option to Lovers Cove is Casino Point Dive Park. This is located at the point well demarcated by the historical symbol of Avalon, the Casino. This is a very popular and well-visited dive location centered around the thick kelp forest that grows abundantly around the jetty protecting the island city from ocean storms. Although not as remote and private as some of the other dive spots on Catalina mentioned, this is a very nice location and perfect for the beginner scuba diver to get comfortable diving in the ocean. On the north east shore of Catalina Island is a remote campground accessible only by boat or kayak. Italian Gardens has three separate beaches and is one of eleven primitive boat-in only campgrounds on the island. Although permits are always required to camp here, keep in mind that there are no facilities what so ever. All oaters and kayakers will have to pack everything in, as well as out with them. This is one of the most desirable diving and snorkeling locations on the island. The remote beaches are clean and the water is crystal clear. The marine ecosystem here is primarily centered around the beautiful forests of giant kelp, which provide the ideal habitat for many various species of invertebrates, fish and your occasional shark and ray. Ship rock is one of the two rock outcroppings off the shore of the isthmus, and the quaint island village of Two Harbors on Catalina Island. Ship rock jets out of water over 10 meters and is considered one of the best dive spots on the island. Surrounding the rock are dense kelp forests going to depths between twenty and fifty feet. This is a very popular destination for free divers and spear fisherman, yellow tail tuna, lingcod, barracuda, cabezon, calico bass, Sheephead, blue-banded gobies, horn sharks and lobsters can all be found in here. Although it can get quite chilly below 60 feet, you can follow the outcropping down to depths of 100 feet to reveal angel sharks, bat rays, nudribranchs, yellow zooanthid anemones, and other rare and quite fascinating marine vertebrates and invertebrates. Just beside the highly desirable cove of Emerald Bay is Doctors Cove, another highly sought dive spot on Catalina Island, with a wide diversity of marine ecosystems and abundant wildlife. Considered one of the top dive spots on the island, you can enjoy the chance of seeing thick kelp forest growing right beside a rocky reef and sandy botton environment. Daily sighting from our science camp Mountain and Sea Adventures report shovelnose guitar fish and other rays and skates, leopard sharks and horn sharks, a wide variety of fish and marine birds such cormorant, brown pelicans, western grebes, and even the occasional arctic tern. One of the most famous dive spots on Catalina, and frequently visited by scuba diving tours, private charters and yachters; Indian Rock is a rocky reef creating a small island in the center of the beautiful bluish-green waters of Emerald Bay. Not only a fun and abundant divine location, Indian Rock is a very valuable habitat and sanctuary for marine birds, which use the inaccessible nooks and crannies of the rocks as nests and feeding grounds. This is an ideal location for yachters looking for a beautiful cove to relax and play in the water. A short swim from the rocky reef is Sandy Beach, which as its name suggests is a long patch of sand that offers a great place for sunbathing and beach games. You never know what you will find, in the fall of staff at 2015 the campers and Mountain and Sea Adventures discovered a rare deep sea oarfish which had just recently washed up ashore Sandy Beach, and provided an amazing opportunity for the school group having their marine science camp that week to see something extremely special! Bringing your students to camp on Catalina Island is bound to enrich their lives (not only academically, but personally, as well). Coming to camp on Catalina places each student outside of their comfort zone, where they have to try new things and explore untapped potential, talent and interests. Camp is a safe place where each child can learn and grow freely, without the pressures of needing to perform and compare their results to their peers. This leads to the opportunity for profound self development and breakthrough, as students see there is more to life than what they have been shown in their home towns, and that they can achieve anything they set their minds on. Coming to science camp on Catalina Island gives each student the chance to see that there are endless opportunities and directions they can take their lives. Activites such as snorkeling and kayaking, which place students completely outside of anything they have ever experienced before, proves to themselves that they are capable of greatness, and truly can be what ever they set out to be. This kind of experience can be enough to spark hope in the heart of a child whom may not have much else going for them, but who can now hold onto a dream and begin working towards achieving it. Outdoor education shows students that learning is not only fun, but can be one of the most exciting parts of their lives if they approach it right. Learning enriches such activities as snorkeling, hiking and kayaking; having a chance to learn about the animals you will encounter in the activity gives the students the opportunity to get more interested in seeing the actual animal in the wild. When they do see the animal during the activity, they are infinitely more excited because of the facts they have learned about it during the lecture. Before long, students are seeing themselves becoming marine biologists, or pursuing other higher education goals because of how much fun they have seen learning can be. Hiking on Catalina Island is an extraordinary experience, nowhere else can you access such an abundance wildlife and scenic beauty. 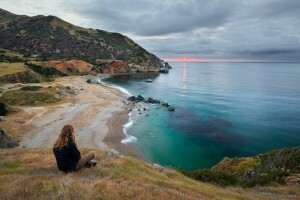 Catalina is an exceptionally well-maintained nature preserve with some of the most awe-inspiring scenery in the world. With the fact that it is only an hour across the channel from the port of Los Angeles, the many various trails and campgrounds offer a very valuable and easily accessible resource to nature enthusiasts. 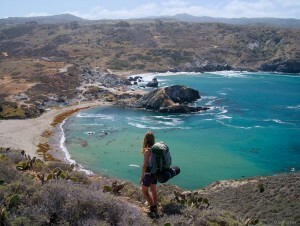 There is a wide variety of trails and campgrounds on Catalina Island, ranging to relative easy to access, such as Hermit’s Gulch just on the outskirts of the island village of Avalon, to more remote sites such as Parson’s Landing on the west end of the island, or Black Jack campground at an elevation of 1600 ft. 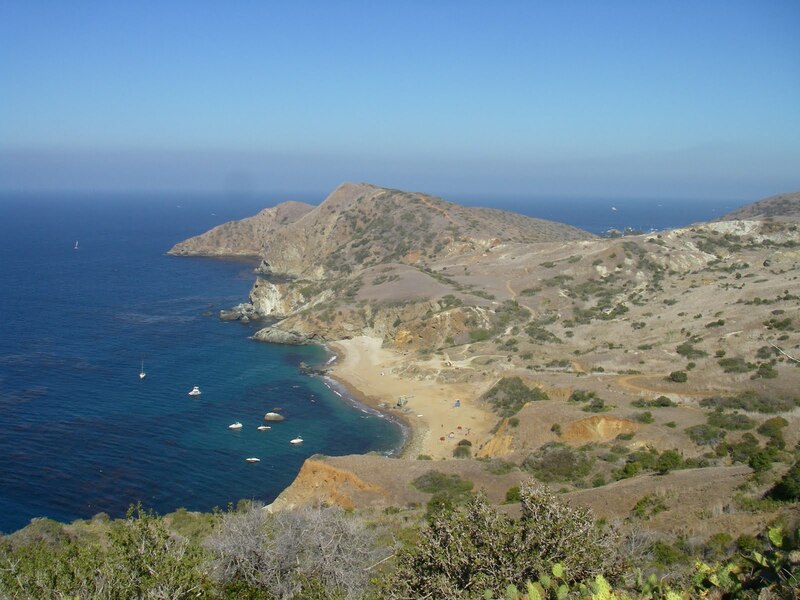 The trans Catalina trail is the most popular trail, it can be said to be the main trail that runs the breadth of Catalina Island, from the east end to the west. A total of 37.2 miles long, the trans Catalina trail begins in Avalon and ends at Starlight Beach on the extreme west end of island. There are many smaller trails people do which are segments of the trans Catalina trail, to do the entire trail from beginning to end takes a dedication of several days and is only for the most avid and serious backpackers. Although most parts of the trail have been blazed for decades, the trail got its official status only as recently as 2009. A good portion of the trail is well-used dirt roads, but other segments are relatively new. Most people who do the full trail begin in Avalon and do the most challenging leg first, which is a 15 miles trek to Black Jack campground, which is nearby the highest point on the island, Mt. Orizaba. The next day could easily be Little Harbor or Two Harbors. The third day you can make it all the way to Starlight Beach. Day four can involve hiking back to Two Harbors and taking the ferry from there or catching a bus back to Avalon. Just beyond the Hermit Gulch campground turn right to follow the signs towards the Hermit Gulch trail. This trail is 11.75 miles long and offers breathtaking ocean views and a broad range of biodiversity; the top of the trail is a panoramic view over Avalon and the channel. 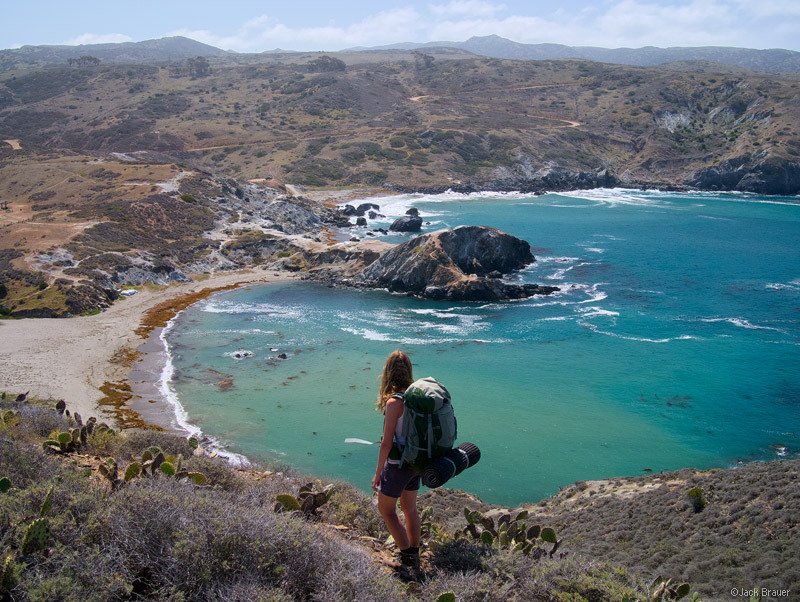 This stretch of the trans Catalina trail is 5.6 miles long, and runs right along coast of the back-end of the island, offering amazing scenery. This is a relatively easy stretch of the trail and perfect for the beginner to intermediate ranged backpacker. From Two Harbors walk up the road leading to the Banning House, but instead of turning up the driveway to the bread and breakfast just continue along the road until you come to the trail head, which is noticeable because it departs the main road and follows the edge of the coast line. Arriving at Little Harbor is an experience unto itself; it looks like a tropical oasis with short stubby palm trees and lots of green grass. The atmosphere at Little Harbor is very relaxed and charming, it feels like you’re on the opposite side of the world! For those planning a more leisurely holiday and want to bring along more gear for outing, a bus runs multiple times a day from Little Harbor, tickets can be purchased from the visitors center at the base of the pier. The fact you can take a bus to Little Harbor also means you can leave from there on your hike to reach even more remote destinations on the island, such as Ben Weston, a popular but very secluded island beach. Another popular is to follow the main dirt road out of town from Two Harbors towards Emerald Bay. Once you get to Emerald Bay continue following the dirt road towards Parsons Landing. 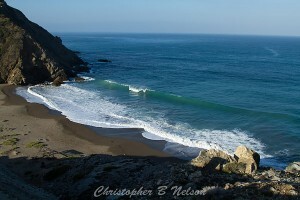 There is a campground there, or you can continue on the trans Catalina trail towards Starlight Beach. Hiking and camping on Catalina Island requires a permit, which can easily be acquired from the visitor’s center in either Two Harbors or Avalon. In even the most remote campgrounds, your reservation guarantees you access to a locker with a cord of firewood and 2.5 gallons of drinking water. 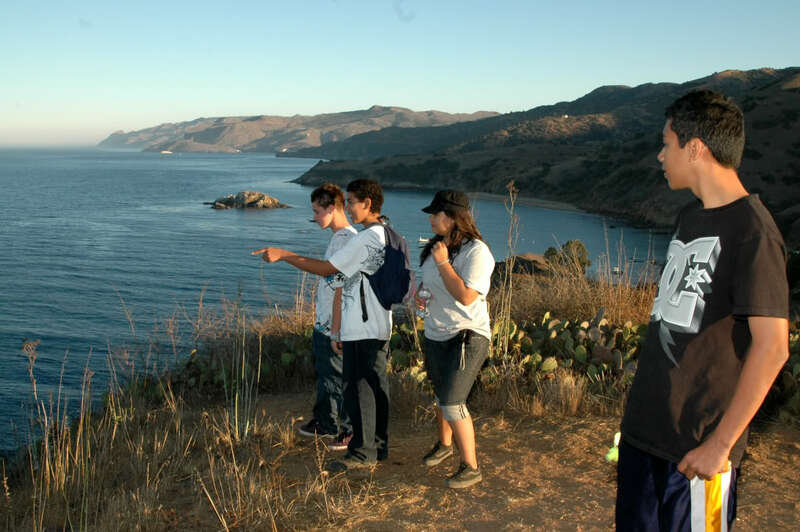 Mountain and Sea Adventures marine biology camp on Catalina Island is a one-of-a-kind, once in a lifetime educational experience that inspires students to dream big, break their fears and change their world. This program brings together hands-on field biology activities with character building, team work and imparting a deep personal understanding, love and appreciation for the awe-inspiring world of natural science. Students, teachers and chaperons all benefit greatly from participating in MSA’s fun and highly educational activities beginning the moment you step off the boat to the beautiful and enchanting premier location of Emerald Bay, which hosts 4 marine ecosystems,world class salt water aquariums and touch tanks, and scenic outdoor classrooms set in the beauty of Santa Catalina Island, one of the largest privately operated nature preserve islands in the world. You enjoy activities such as kayaking, snorkeling, squid dissection, hiking, plankton trawls, microscope labs, shark touch tanks and a wide diversity of both terrestrial and marine wildlife. Each of MSA’s activities involves hands-on learning opportunities and the opportunity to build character traits such as courage, perseverance, stewardship and leadership. Your students learn how to keep a field journal and utilize the scientific method to develop and refine their own hypothesis, thus learning how to think and perceive the natural world around them through the eyes of a field biologist. Coming to camp on Catalina Island is the opportunity of a life time and guaranteed to be the highlight of your school year, and bound to touch the lives of each and every person whom attends. 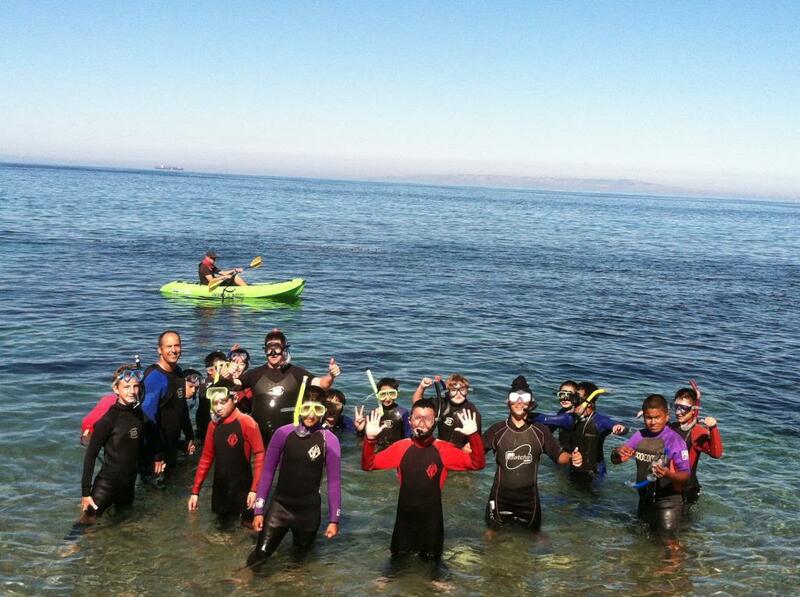 It’s now easier than ever to bring your class or group to Catalina Island for an educational experience that they will cherish for a life time! 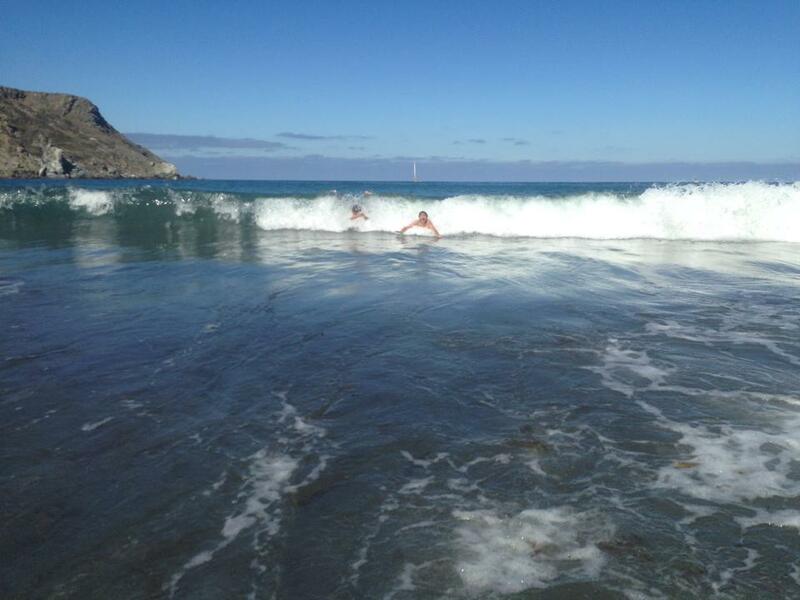 What is it that is so special about surfing on the backside of Santa Catalina Island? Is it how remote it is? 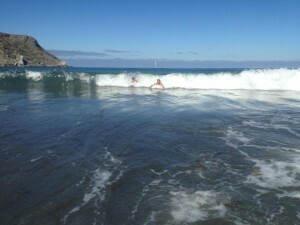 The pristine and beautiful landscape of Catalina, with its unspoiled terrain and clean beaches? Is it the fact that the ocean swells which form waves break here first, before breaking into the smaller swells that reach the California coastline? One thing is for sure; it takes a dedicated nature enthusiast to reach some of these locations, a few of which are only accessible by boat. 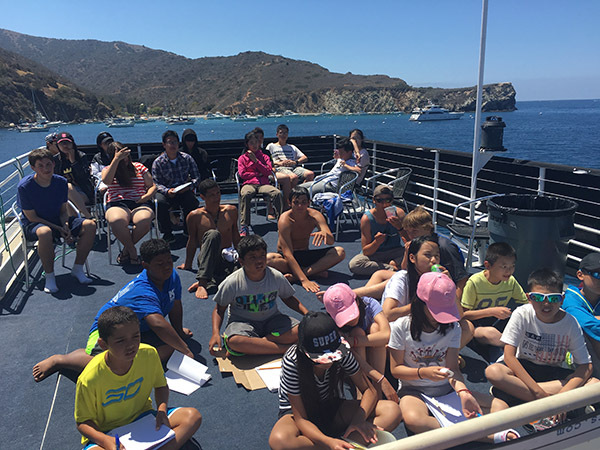 During our week long Catalina Island summer camp, students live aboard a fully equipped marine research ship and tour around the various coves of the island, enjoying all the best snorkel and dive locations, beaches and hiking trails, and surf spots. The most easily accessible and most reliable break is found at the beach right next to Little Harbor campground, called Shark Harbor (it is named after a large rock that jets out into the water resembling the head of a shark). A tour bus will take you either from Avalon, or the quaint little island town of Two Harbors to and from this remote but beautiful oasis-like campground. Pitch your tent, and waxes down your surfboards for a comfortable weekend island get away. A short 5-minute hike to the next cove over from your campsite reveals, Shark Harbor, which has a small to medium sized but fast and powerful break. The next most consistent and even more desirable of a surf spot on Catalina is Ben Weston. This location is never crowded due to the extreme remote location of this incredible beautiful and scenic island beach. As for Shark Harbor, summer is the best time to visit Ben Weston. According to locals, this break is best when the wind is coming from the east; and the ideal swell direction being from the west northwest. We take our teen summer campers to this location, and spend a night or two camping at Little Harbor, and then hiking to the various locations nearby each day. For those coming on your own, first take the ferry boat to Two Harbors, and book a tour bus to Little Harbor Campground. You will then need to hike the rest of the way along the road (away from town). Be sure to always stay on the right when there are any forks in the road, you want to stay along the coastline and at no point go into the interior. Eventually you will come to the bottom of a canyon and there will be a Catalina Island Conservancy sign pointing towards a trail marked ‘Ben Weston’. A long nature trail, which follows the canyon creek, brings you to Ben Weston Beach. It has reported to be an excellent long board wave. It might help to remember these GPS coordinates: Latitude: 33° 22.575′ N; Longitude: 118° 28.749′ W.
There is no other feeling on earth compared to riding a wave, and something just as sweet about coming out of the ocean to rest and relax on a remote beach on the back side of an island only an hour off shore Los Angeles! Learn more about our 2016 Catalina Island Summer Camp program!